Prof. Novoselov led the constructiona and establishment of the National Graphene Institute in Manchester. He also was its first scienctific director. Prof. Novoselov was awarded Europe Research Council (ERC) Synergy grant under FP7 in November 2013 (jointly with Prof. Falko and Prof. Ferrari). This was the first wave of the Synergy grants ever awarded, in which 11 grants were given (chosen from 700 applications). The project is planned for 6 years, worth around £10.5M and will require intensive research efforts from Prof. Novoselov. Also, Prof. Novoselov is involved in co-ordination (via Scientific Advisory Council) and implementation (work-package “Fundamentals”) of the European Graphene Flagship project (a €1bn initiative from the European Union). The project commenced in October 2013 and is expected to last for 10 years. Total citations: > 120,000 times. h-index 92. Current citation rate: > 20,000 per annum. One paper cited over 25,000 times, four – over 10,000 times, 18 – over 1,000 times. Novoselov’s Science 2004 paper is named among top 100 most cited papers ever in all fields. Novoselov has published over 270 papers (mainly as the leading or the corresponding author) with more than 20 papers in Nature and Science, more than 40 Nature Physics, Nature Materials, Nature Nanotechnology and Nature Communications papers and 15 Physical Review Letters. Novoselov’s two papers in Science 2004 and Nature 2005 are the most cited papers on graphene and “have opened up a fast moving front” (according to ISI’s Essential Science IndicatorsSM). The Science paper has also been acknowledged as “one of the most cited recent papers in the field of Physics” (according to the ISI citation index, cited more than 25,000 times). 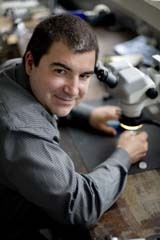 In 2015 and 2014 Kostya Novoselov was included in the list of the most highly cited researchers. Kostya Novoselov made into a shortlist of scientists with multiple hot papers for the years 2007-2008 (shared second place with 13 hot papers) and 2009 (5th place with 12 hot papers). 2010 Nobel Prize for "groundbreaking experiments regarding the two-dimensional material graphene". Nobel lecture. 2008 European Research Council, Starting Grant "Physics and Applications of Graphene"
2006 Royal Society Research Fellowship "The scheme by The Royal Society (UK) aims to provide outstanding scientists, who should have the potential to become leaders in their chosen field, with the opportunity to build an independant research career"
Science 2004 and Nature 2005 Novoselov’s two papers in Science 2004 and Nature 2005 are the most cited papers on graphene and “have opened up a fast moving front”, ISI’s Essential Science IndicatorsSM. The Science paper has also been acknowledged as “one of the most cited recent papers in the field of Physics”, ISI citation index.